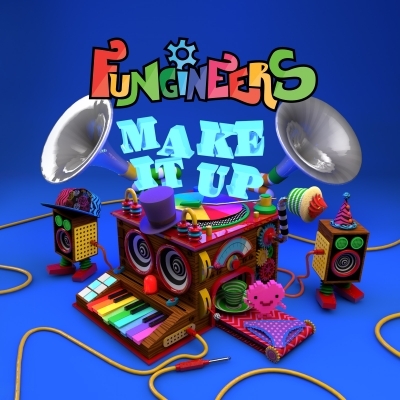 Known for innovative Fun filled videos and onstage antics with wild characters and improv action, the Fungineers encapsulate elements of their hypercolor surrealism into five feisty tracks with Make It Up EP. A playful release that features a gang of guest artists and help from Australian producer Spoonbill, Make It Up EP is a quick and colorful blast of sonic shenanigans, tight vocal design and wonkadelic beats. Serving up unique new flavors of musical smoothies, the EP swerves between inter-dimensional rainbow hip hop, animated dance beats and the sound of something smiling. Blending beatboxing with bass heavy production and live instrumentation, Make It Up EP is a Fun romp that feels like an impromptu hangout with friends on a sunny afternoon. Make It Up EP begins with “Vocal Vacation,” an all-vocal instrumental that showcases the group’s natural talents with bumping beatboxing and silly sassy acappella sounds. “Flip Time (feat. Dub FX, Blurum 13 and Lafa Taylor)” features shifting tempos that mirror the thoughtful lyrical content, with a dusting of tropical horns to complement the tricky rapping styles. A potent party sing-a-long rippled through with a strutting trumpet, “Best Friends (feat. Honey Larochelle, Erica Dee, Lafa Taylor and Russ Liquid)” caps off the Fun EP with a happy collection of golden tones, a head-nodding groove and a giant group hug.